To ensure a high-quality experience for those attending, this curated event only has a limited number of seats available. 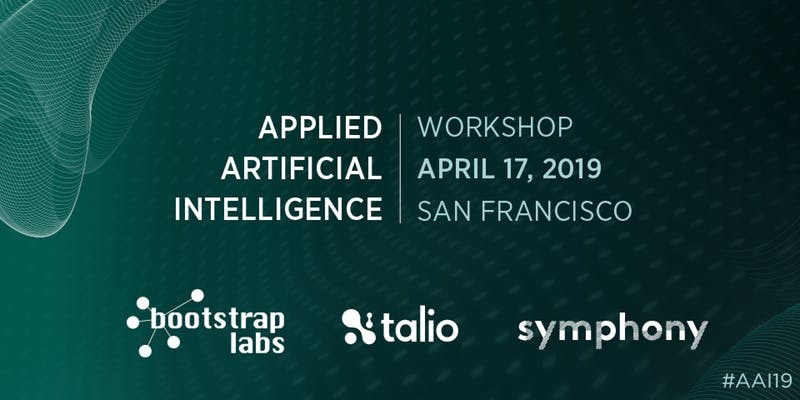 BootstrapLabs in partnership with Talio Technology, Symphony and The Office of the CIO, are thrilled to announce our ANNUAL APPLIED ARTIFICIAL INTELLIGENCE WORKSHOP. Pre-BootstrapLabs Applied AI Conference 2019 exclusive workshop. This year, our workshop is focused on providing actionable insight exclusively to those poised to make critical decisions for the future of their companies – CIOs, VPs, Executives and Tech Leaders. Held at The Battery, one of San Francisco’s most exclusive Members Only clubs, this day-long workshop will help you cut through all the noise and buzzwords in Applied AI with content specifically designed for business decision makers. To ensure a high-quality experience for those attending, this curated event only has a limited number of seats available. All attendees will be vetted to ensure they meet the qualifications to attend based on their role or title. Talio Technologies – Talio powers the talent transformation of leading companies by equipping their workforce with the knowledge and skills to leverage emerging technologies to compete in tomorrow’s economy. As top technologist educators, Talio is committed to building engineering communities that inspire growth beyond the classroom. Symphony – For nearly 10 years, Symphony has focused on building thriving teams of engineers that empower global entrepreneurs to make their vision real. With teams that span from San Francisco to Sarajevo, Novi Sad, Belgrade, Skopje and Amsterdam, Symphony is able to tap into local culture and wider technology trends that reflect the world and ensure that their solutions are at the forefront of technological advancement. OOCIO – The Office of the CIO Community (https://www.oocio.org/) is an energetic, dynamic, and collaborative group of information technology executives. The organization is dedicated to improving the value of its members to their company, community, and to the profession.